The Great Britain is not announcing any special economic reports; however, the US is giving the Initial Jobless Claims report. 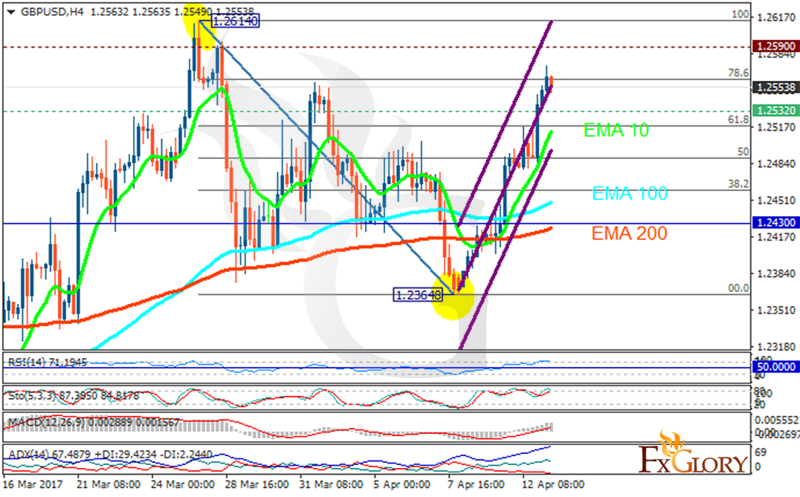 The support rests at 1.25320 with resistance at 1.25900 which both lines are above the weekly pivot point at 1.24300. The EMA of 10 is moving with bullish bias along the ascendant channel and it is above the EMA of 200 and the EMA of 100. The RSI is moving in overbought area, the Stochastic is moving in high ranges and MACD indicator is in positive territory. The ADX is showing buy signals. As the price has already reached the 78.6 level of Fibonacci, pullbacks can start very soon. The support level breakthrough will smooth the way for further decline targeting 1.2400 otherwise it will grow to 1.26.